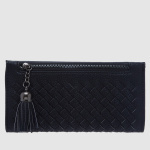 Ensure the safety of your money and credit cards by keeping them in this wallet. The snap closure provides easy opening and closing of the wallet. The zippered compartment allows for extra storage.